Worked late into the night? Baby didn’t let you sleep? Stayed out with your friends? Your eyes are the first to reveal fatigue, stress and lack of sleep. Since the skin around your eyes is very delicate, compared to the rest of your face, it’s also the first to reveal fine lines and other signs of aging. Because life doesn’t always let us get 8 hours of sleep, we have just what you need- a little extra TLC for your eyes to help you wake each day to brighter, smoother, more youthful-looking eyes! Introducing our all-in-one YOUTH Restoring Eye Treatment, a multi-tasking powerhouse that delivers powerful anti-aging benefits and visible solutions to tired, dry or puffy eyes. Plus, it’s 100% vegan, cruelty free and gluten free. There’s so much more to it than meets the eye! 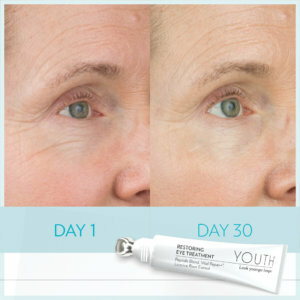 Features a unique cooling tip that refreshes and energizes the eye area with a gentle massage at application. How cool is that! This all-in-one eye treatment is an essential add-on to the YOUTH Advanced Anti-Aging Regimen (use it after your toner and before your serum). It’s suitable for women and men of all ages and leaves skin hydrated, refreshed, and more radiant. Restoring Eye Treatment is formulated with powerful moisturizing and anti-aging ingredients and botanicals, including a powerful Peptide Blend, Licorice Extract, and Lotus Japonicus coupled with Schisandra Chinesis, along with Hyaluronic Acid, Muscadine Grape and Vital Repair+® Complex. Use YOUTH Restoring Eye Treatment day and night and it won’t matter if you forgot to put on your makeup this morning or how long you were chasing the kids around yesterday. *As measured in a 28-day Clinical study, 36 subjects, twice daily use. **As perceived by a significant majority of subjects in a 28-day Clinical study, 36 subjects, twice daily use.